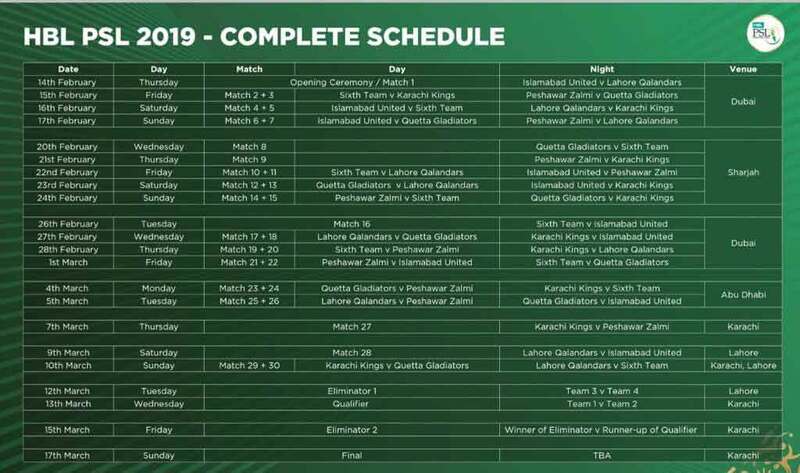 LAHORE: Pakistan Cricket Board has released the schedule for fourth edition of Pakistan Super League to be played from 14th Feb to 17th March. The league will be played at five venues across the UAE and Pakistan. 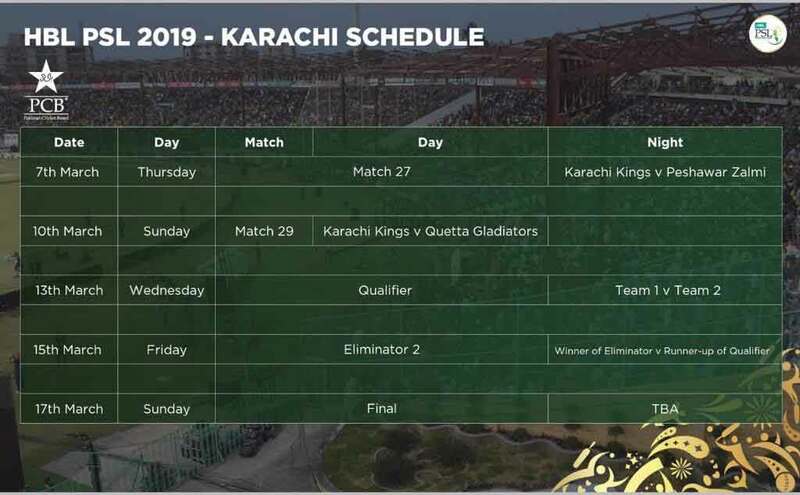 Thirty-four (34) matches will be played and for the first time in the short history of this highly successful tournament, Lahore and Karachi will share eight matches between them at the backend of the 32-day event. 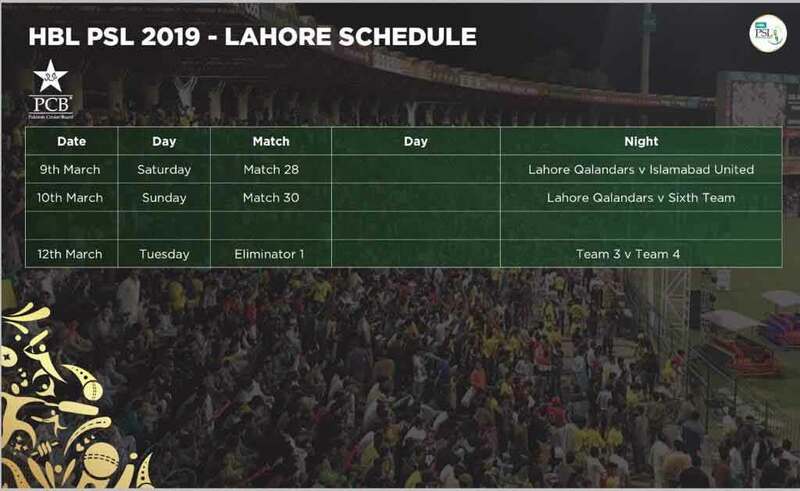 The Gaddafi Stadium in Lahore will be the venue of three matches, namely: Lahore Qalandars versus Islamabad United on March 9, 2019, Lahore Qalandars versus the Sixth team on March 10, 2019 and Eliminator 1 (3 v 4) on March 12, 2019. All the three matches will be played under floodlights. According to the event format, each side will play the other twice with the top-four after 30 event matches advancing to the play-offs. In the March 13, 2019 Qualifier, the table-toppers will play the second-placed side with the winner progressing to the final. The losing side will get a second chance to qualify for the final when, in the March 15, 2019 Eliminator 2, they will play the winner of March 12, 2019 Eliminator 1, which will be between the third and fourth-placed sides. “The PCB is delighted to announce the schedule of the HBL Pakistan Super League 2019, which marks two months to go to one of the PCB’s marquee events which continues to grow in reputation and stature. “The PCB is committed to working harder to make the HBL PSL an even bigger and better tournament, with the focus being to provide top notch playing facilities to the players, increase the fan base and provide the followers complete entertainment, and ensure all interests of our key stakeholders are adequately and professionally taken care of. “The PCB believes the HBL PSL is a gateway to resumption of international cricket in Pakistan. By successfully staging eight matches in Lahore and Karachi with the support of the local authorities, the PCB is optimistic that it will once again prove to the world that Pakistan is as safe and secure a place as any other part of the world to play international cricket. In only in its fourth year, the HBL Pakistan Super League has grown into one of the biggest and most competitive tournaments, evident from the fact that the world’s leading and most attractive cricketers continue to make themselves available for this competition. South Africa’s AB de Villiers and Brendan Taylor of Zimbabwe, who will wear Lahore Qalandars’ kits, and Steve Smith of Australia, who will represent the sixth team, are three of the 19 players expected to make their PSL debuts in 2019. The players have also expressed their enthusiasm and interest in the start of the HBL PSL 2019.